Giroud Tree and Lawn Earns Angie’s List “Super Service Award” for the Tenth Year in a Row for Tree Service and Lawn Treatment Service Programs. Giroud Tree and Lawn wins the prestigious “Super Service Award” from Angie’s List for the tenth year in a row based on consumer reviews and high level of satisfaction reported by Angie's List members for Giroud's tree service and lawn treatment service programs. 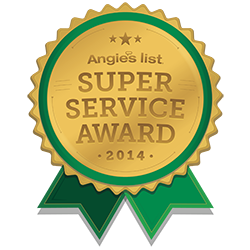 Giroud Tree and Lawn has been awarded the prestigious and difficult-to-attain Angie's List Super Service Award for 2014. Based on 97 recent reviews in the categories of Tree Service, Lawn Fertilization & Treatment and Lawn and Yard Work, Angie's List members gave Giroud an A grade, the highest possible score. “Giroud Tree and Lawn is the only tree service and lawn treatment service company in the Philadelphia region to win the Super Service Award every year since the Award was established locally in 2005,” notes Lou Giroud, Giroud Tree and Lawn President and ISA Certified Arborist. “Friendly staff answering the phone, on-time arrival, expert tree service and lawn treatment service programs by ISA Certified Arborists and meticulous cleanup are just a few of the ways we ensure that customers love doing business with us,” he added. Giroud Tree and Lawn specializes in tree service, tree removal and lawn care programs that make customers love doing business with the company since 1974. Serving Bucks, Montgomery and Philadelphia Counties, the company offers professional tree and lawn evaluation, tree pruning, tree removal, insect and disease control, fertilizing, stump removal and traditional and 100% organic lawn programs to keep lawns healthy and green . Giroud Arborists are certified by the International Society of Arboriculture (ISA) and have the knowledge and experience required to properly diagnose, treat and maintain trees and lawn health. The company is Accredited by the Better Business Bureau and has been awarded the Angie's List Super Service Award® every year since 2005. The “Giroud Treework for Charity” program donates free tree care services to parks, historical sites and other non-profit organizations located in the Company’s service area. For more information, visit the company website at http://www.giroudtree.com or call 215-682-7704.